Back in 1995, I think there was a series of artbooks released for Dragon Ball, one of which was translated by Viz Media into the English edition called Dragon Ball: The Complete Illustrations. I said "I think" because I saw several other volumes on Amazon Japan that had the same cover art format. 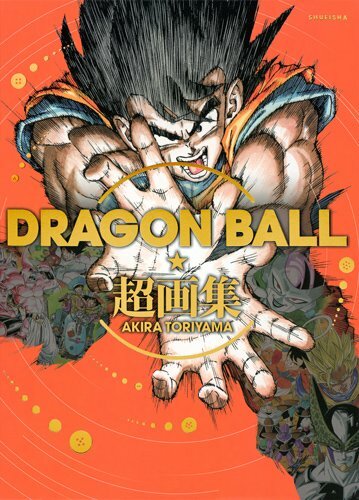 Anyway, fast forward to 2013, there's this new artbook called the DRAGON BALL超画集 (Dragon Ball Ultimate Artbook). This is a 240-page hardcover slipcase edition published by Shueisha (集英社), the same publisher for the Japanese artbooks. The book collects the Dragon Ball illustrations from the original manga series, the updated series in 2002, the short series Neko Majin, miscellaneous art created over the years after the manga run ended in 1995, such as those for Japanese comic magazines, up to the 2013 animated film Dragon Ball Z: Battle of Gods. At the back of the book is an index with captions to all the artworks listed. This also includes the self portraits of Akira Toriyama from each of the manga volumes. The art is fantastic, they look great even back when Akira Toriyama was just starting out, and it just gets better. The full colour illustrations are wonderfully reproduced on the thick pages. The production value for this book is high and comes with nice slipcase. In terms of duplication, this book has most of the art from Dragon Ball: The Complete Illustrations with just changes in layout and sizes of the artworks. The additional illustrations are from within the last decade from 1995 onwards until 2013, and those make up about 100+ pages. So some of the artworks in the earlier book has been taken out and replaced by the new artworks. Is it worth it to get this book if you have the Viz Media's English book? Well, I think it would have to depend on whether you have been following Dragon Ball after the manga series have ended. It would make more sense because you'll be able to relate more the the artworks. Many of the illustrations towards the back of the book are from after 1995. It's quite nostalgic looking at the early artworks. Reminds me of the fun times when reading the manga as a kid. I remember marvelling at the miscellaneous illustrations that are not related to the story, such as those chapter splash pages where there are vehicles such as bikes and cars. Dragon Ball could be what got me interested in manga and art in the first place. I'm not sure if Viz Media is going to translate this from Japanese, you can contact them to find out. This is a nice updated edition for Dragon Ball fans.